Sonia Angus: Christmas Smells & Sounds = Buy, Buy, Buy! For as long as I can remember Christmas has been associated with scents and sounds. From the angels singing while the wise men gave baby Jesus frankincense and myrrh, to the smell of cinnamon and the jingle of sleigh bells today. As it’s coming up for Christmas shops have started to decorate but it’s not just for the warm fuzzy feeling and the enjoyment of their customers that they do this. Most retailers depend on strong Christmas sales every year and by dressing their store up they increase their profitability. ‘It’s beginning to smell (and sound) a lot like Christmas: the interactive effects of ambient scent and music in a retail setting’ an article by Eric R. Spangenberg et al. 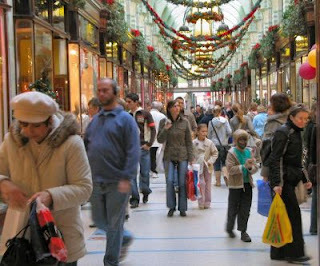 looks at the effects of ambient scent and music on a customers evaluation of a store, it’s environment and merchandise. The article compares customer reactions in a mock retail setting where no Christmas scent vs. Christmas scent and no Christmas music vs. Christmas music is applied. They found that Christmas scent buying effects are moderated by music. Customers react better when scent and music are combined equally. Where there is scent but no music stores evaluations are lowered. Shops need to keep scent and sound consistent or there will be no affect on a customer’s behaviour. Therefore it is a wise choice for shops to evoke the spirit of the Christmas season by implementing environmental cues and creating a welcoming, pleasant atmosphere. It would be interesting to see whether or not this theory works for other holiday seasons such as Halloween or Easter. Also if it’s not Christmas would Christmas scent and sound still make you buy? Probably not as other factors would be missing such as, time of year and general holiday spirit. However different scents and sounds may be capable of increasing profit. In the ‘Hollister’ shop for example there is a distinct smell and music is played loudly throughout the store. Most people enjoy this especially the smell. You can smell the store before you see it so it is instantly recognisable, the clothes inside are sprayed with the signature scent so when you buy something and wear it for the first time you remind other people that recognise the smell of the brand. The shop then has extra items to sell as customers can buy bottles of perfume or the CDs that are played. Scent and sound is a very clever non intrusive way to encourage people to buy, most of the time you won’t even notice you’ve been affected. I guess it’s the same as when you smell a Starbucks coffee then suddenly have to buy one.